Editors: Mason-Whitehead, Elizabeth, McIntosh, Annette and Bryan, Ann, et.al. 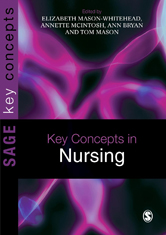 This book will introduce the new student to the major key concepts in nursing and will also provide a linkage into other relevant key concepts as building blocks to a fuller understanding of the overall framework of nursing in contemporary times. It will also inform the reader where to look for exploration into a more detailed appreciation of the issues relating to the key concepts. We hope that this book will help the confused nurse who may be reeling with the abundance of issues surrounding modern-day healthcare delivery. Finally, we envisage that this book may also be of use to lecturers, mentors and clinical supervisors as an access point to the key concepts in nursing and the issues involved in employing them in practice.